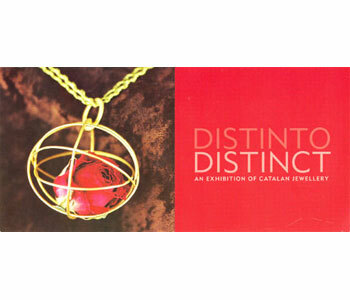 The name Distinto-Distinct was chosen as this encapsulates the essence of the project which presents pieces that are strikingly arresting to the viewer and also shows the contrast between contemporary British and Catalan jewellery. The project included plans to promote cross-fertilization between the participating designers via some form of cultural exchange.The British Crafts Council gave a grant, which enabled the production of a catalogue, and provided some financial assistance for the British jewellers to attend the preview of Distinto - Distinct at Hipotesi, and participation in a day of joint presentations at the Escola Massana, led by the head of the Jewellery Department, renowned Catalan jeweller, Ramon Puig Cuyas. Funding from Yorkshire Arts allowed two of the Catalan designers to visit Salts Mill to attend the preview of Distinto - Distinct, and lead a master-class for local designer jewellers at the Yorkshire Craft Centre, and give a presentation about their work at a public 'Talk and Tapas' event In the gallery. Artists featured in 'Distinto-Distinct' are: Carmen Amador; Greco Garcia Tebar; Xavier Ines Monclus; Montserrat Martin; Silvia Piva; Milena Trujillo Acosta; Jessica Briggs; Christina Hirst; Kathryn Marchbank; Jo McAllister; Dot Sim; Sarah Stafford.